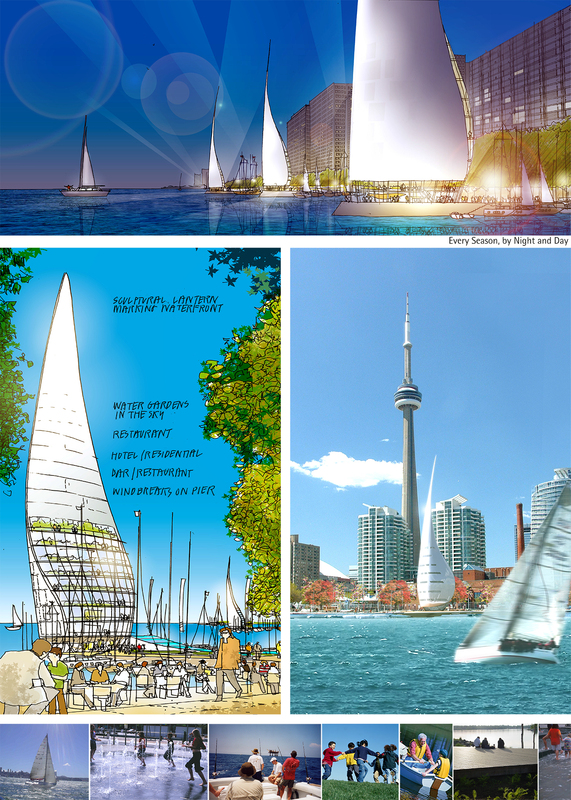 This scheme is a vision for a Toronto that is reunited with its waterside heritage. 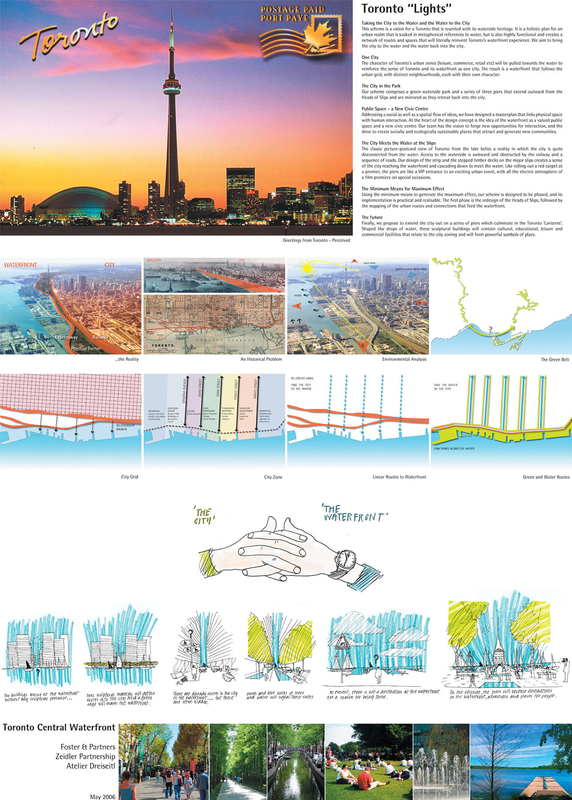 It is a holistic plan for an urban realm that is soaked in metaphorical references to water, but is also highly functional and creates a network of routes and spaces that will literally reinvent Toronto’s waterfront experience. We aim to bring the city to the water and the water back into the city. 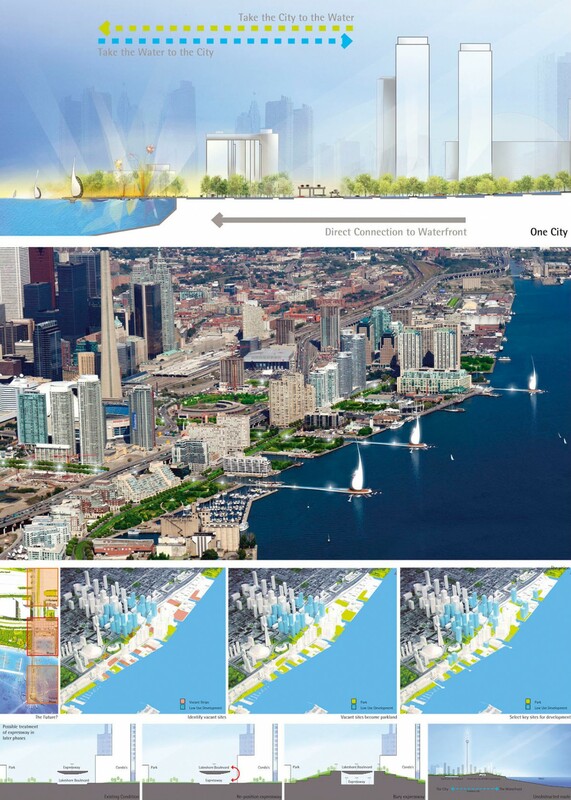 The character of Toronto’s urban zones (leisure, commerce, retail etc) will be pulled towards the water to reinforce the sense of Toronto and its waterfront as one city. 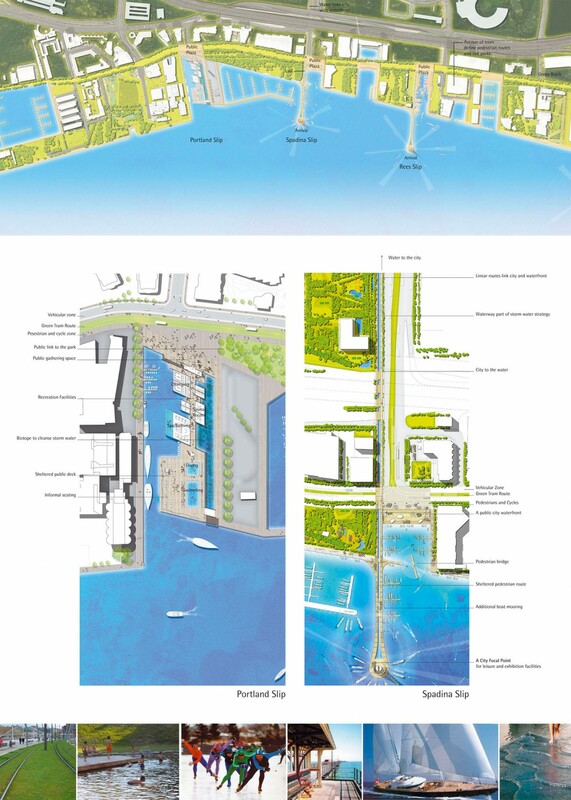 The result is a waterfront that follows the urban grid, with distinct neighbourhoods, each with their own character. Our scheme comprises a green waterside park and a series of three piers that extend outward from the Heads of Slips and are mirrored as they retreat back into the city. Addressing a social as well as a spatial flow of ideas, we have designed a masterplan that links physical space with human interaction. 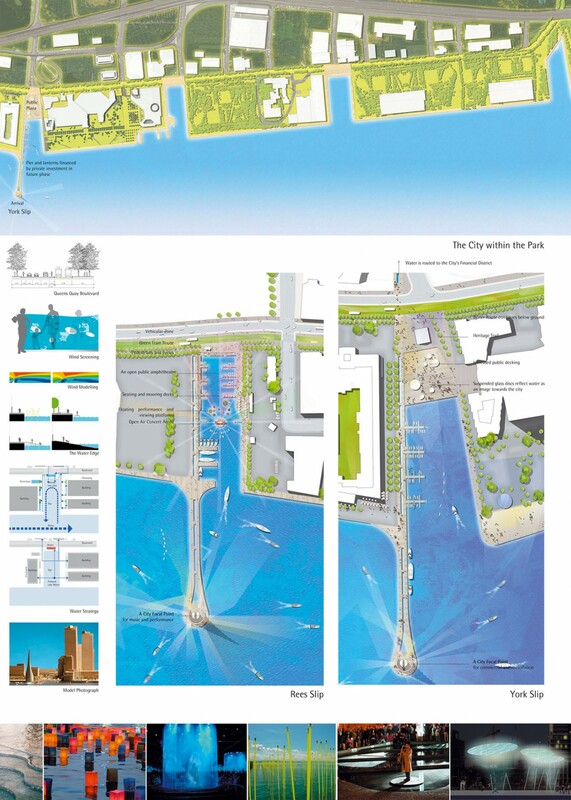 At the heart of the design concept is the idea of the waterfront as a valued public space and a new civic centre. Our team has the vision to forge new opportunities for interaction, and the drive to create socially and ecologically sustainable places that attract and generate new communities. The classic picture-postcard view of Toronto from the lake belies a reality in which the city is quite disconnected from the water. Access to the waterside is awkward and obstructed by the railway and a sequence of roads. Our design of the strip and the stepped timber decks on the major slips creates a sense of the city reaching the waterfront and cascading down to meet the water. Like rolling out a red carpet at a premier, the piers are like a VIP entrance to an exciting urban event, with all the electric atmosphere of a film premiere on special occasions. Using the minimum means to generate the maximum effect, our scheme is designed to be phased, and its implementation is practical and realisable. The first phase is the redesign of the Heads of Slips, followed by the mapping of the urban routes and connections that feed the waterfront. 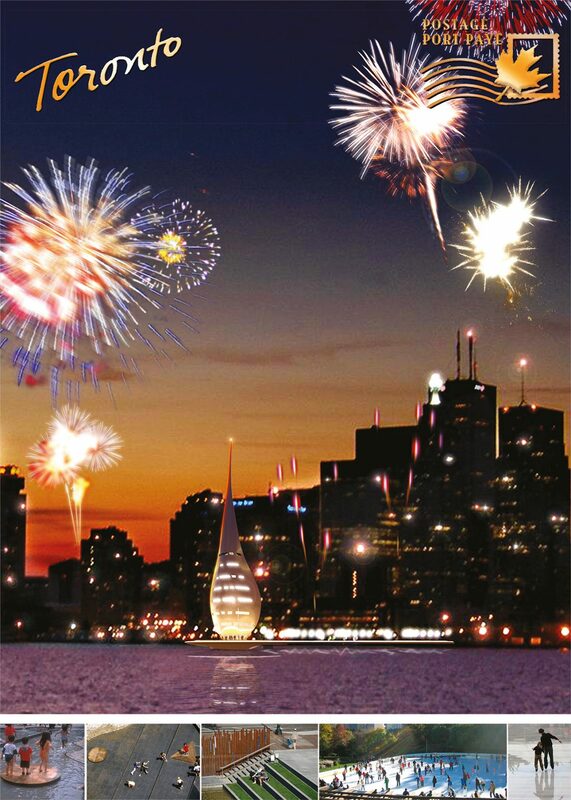 Finally, we propose to extend the city out on a series of piers which culminate in the Toronto ‘Lanterns’. Shaped like drops of water, these sculptural buildings will contain cultural, educational, leisure and commercial facilities that relate to the city zoning and will form powerful symbols of place.